Happy Independence Day for all of us in the U.S.A.! I feel overwhelmed by the blessings I receive from the freedoms I have living in this wonderful country. I hope you are all having a great time celebrating with your family. It has been a jam packed weekend of celebration and getting things done around the house for us. So I’m actually taking today off to spend time doing fun stuff with my husband and children. We’re going swimming and having a cookout. And we’ll see if we make it long enough for the fireworks tonight. 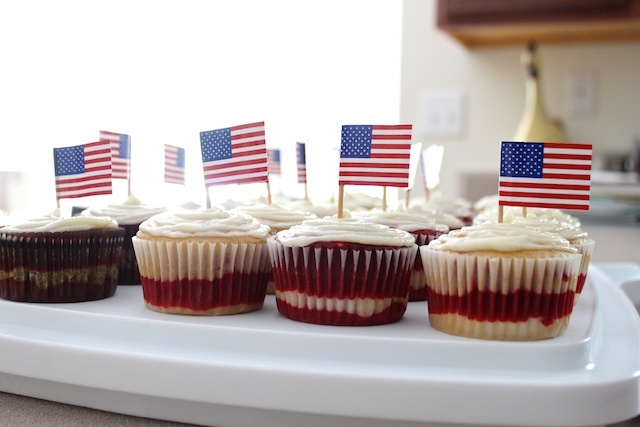 I did make some red and white stripe cupcakes topped with little flags. Adorable or what? It was a mix of red velvet cake for the red layers and french vanilla cake for the white. I decided to keep the frosting at a simple white rather than blue because I’m actually turned off by the idea of blue frosting. It was a huge hit, as you can see those little fingers in the picture below. 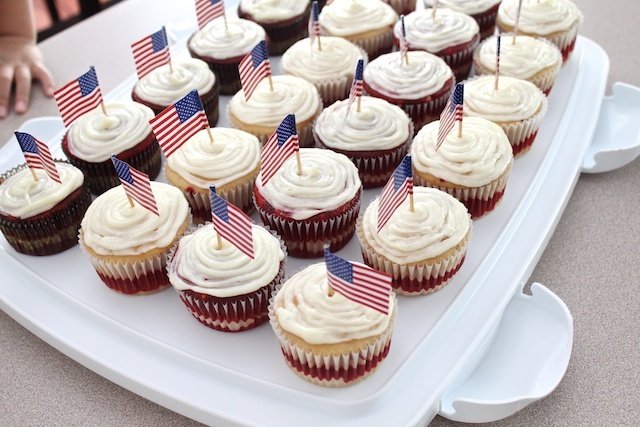 » Tell me… What are you doing to celebrate 4th of July today? What a good idea! I may have to try that next year. I made some red, white & blue strawberries. So cute AND delicious!